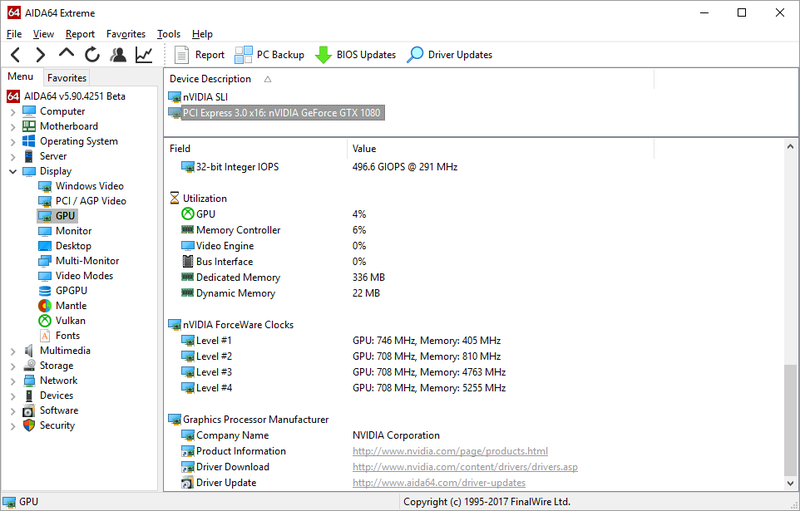 Make sure to enable Wake GPUs up at AIDA64 startup in AIDA64 / main menu / File / Preferences / Stability. You need to restart AIDA64 to apply the changes. Let me know if it helps. Hello, I got a NVIDIA Gt 710 card graphic card so when I do the GPGPU benchmark test, it shows in the Single-Precision around 311.7 GFLOPS, But if you see the GPU specifications in the main window it says 366.0 GFLOPS @ 953 Mhz while running the GPGPU benchmark test. I'm confused with that result, anyone can tell me why is that ? Thanks. I've been using AIDA64 for a some years now and I've put a lot of work in my panel - I really appreciate the support you put into AIDA64! One thing I'd like to add to my panel is the reason for the current limit for the GPU. GPU-Z, EVGA Precision X and MSI Afterburner all have indicators to report the cause for throttling as "Power limit", "Voltage limit", "Temperature limit" or "No Load Limit". I guess these values are available through the nvidia API. I guess the best would be to 4 different sensor values for each of those, each of them being 0 or 1. Is that something you'd consider to add to AIDA64? Ever wondered how big the new nVIDIA Pascal GPU family would turn out to be? Here's the whole list of Pascal SKUs, with their respective PCI device IDs. Enjoy! Note: The list contains a few Maxwell IDs as well, in order to clarify the difference between GMxxx-A and GMxxx-B PCI device regions. Note #2: GM200-B may have been a second iteration, an optimized variant of the original GM200, but never reached the market. Could have been a plan B in case Pascal slips to late 2016 or 2017. Click for the full list of PCI IDs here.